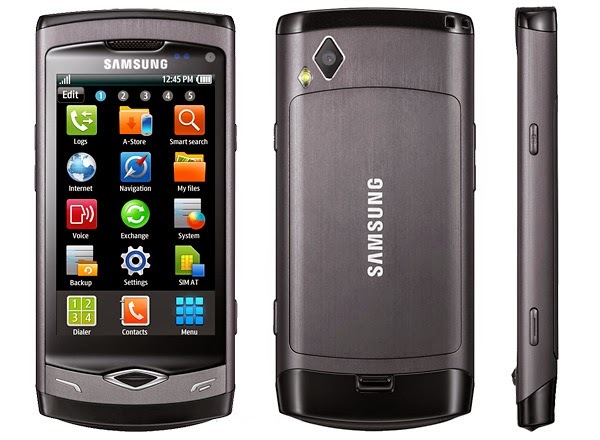 The Samsung Wave (or "Samsung Wave GT-S8500") is the first smartphone running the Bada Operating System designed by Samsung, which was commercially released on June 1, 2010. The Wave is a slim touchscreen phone powered by Samsung's "Hummingbird" CPU (S5PC110), which includes 1 GHz ARM Cortex-A8 CPU and a built-in PowerVR SGX 540 graphics engine. It also has a "Super AMOLED" screen and 720p high-definition video capture capabilities. Due to shortage of Super AMOLED screens, Samsung released a similar version called Wave II and ceased production of the S8500 model. The screen is a 3.3-inch (84 mm) capacitive touchscreen Super AMOLED with an anti-smudge oleophobic coating on top of the scratch-resistant tempered-glass ( Gorilla Glass Display ). The screen resolution is 800x480 WVGA with 283 PPI. The phone features a 1 GHz SoC, which internally contains an ARM Cortex A8 CPU core that is identical to the ARM Cortex CPU core used in Apple's A4 package on package SoC. The graphics engine of the device is a PowerVR SGX 540 GPU which is said to be capable of generating 90 million triangles per second (same as the SoC used on the Samsung Galaxy S). The phone features a 5 megapixel EDOF camera which supports 2560 x 1920 pixels, along with autofocus, LED flash, Geo-tagging, face and blink detection, image stabilization, touch focus,etc. Shooting modes include beauty shot, smile shot, continuous, panorama and vintage shot. As a camcorder it is able to shoot HD recording (1280x720) at 30 FPS with flash. As well as this, it is also able to record slow motion video (320x240) at 120 FPS with flash. In January 2012, Samsung declared that it was planning to merge bada with the Linux-based Tizen which is developed in collaboration with Intel. This move is seen effectively as Samsung dumping its own OS on which they have worked for quite a few years.The Wave was the first phone with Samsung's own Operating System, Bada, meaning "Ocean". Though quite impressive at the beginning, this OS had its hiccups in mid term with the phone hanging constantly and restarting frequently. Samsung worked on the higher versions of Bada 1.2 and later 2.0. Bada 1.2 was released to the world in a phased manner and it was much more stable than Bada 1.0 was. But due to a lack of a powerful core in the OS, application development was limited, a situation which Samsung hoped to rectify by launching Bada 2.0. But Bada 2.0 is yet to be fully released to the world due to lots of bugs found and hence, application development has been throttled. Other features include A-GPS, 2 GB/8 GB of internal storage with a microSDHC slot for an additional 32 GB. It also has a magnetometer (compass), a proximity sensor, an accelerometer, 5.1-channel surround sound Mobile Theater, music recognition, a fake call service, smart search, Social Hub and it is the first phone to support Bluetooth version 3.0. Radio connectivity includes Bluetooth 3.0, Wi-Fi 802.11 b/g/n and HSDPA 3.6 Mbit/s. This phone is available with both European/Asian 3G bandings and the North American 3G bandings. The North American 3G bandings version of the phone is a limited availability and is not available in the US. The phone is the first smartphone to feature the Samsung bada operating system platform. The UI is Samsung's own Touch-wiz 3.0. Touch-wiz 3.0, like the two predecessors (Touch-wiz 2.0 and Touch-wiz), utilizes widgets. The three most notable widgets pre-installed in Touch-wiz 3.0 are Daily Briefing (which includes all essential information such as weather, finance, AP mobile news and schedule), Feeds and Updates and Buddies now (which allows users to call, send texts to and read Facebook/Twitter feeds off their favorite contacts). Users are allowed to have up to 10 home screens to add widgets. For Internet browsing the Samsung Wave has the Dolphin Browser v2.0 (based on WebKit) (or 3.0 depends by the firmware version). This browser supports Flash, but it is disabled by default to improve page loading speed. By default, the phone comes with Picsel Viewer which is capable of reading .PDF and Microsoft Office file formats. Users from selected countries can buy and download Picsel Office Editor from Samsung Apps. Other software includes the GPS software that comes with this phone (LBS Route 66), Facebook, Twitter, social hub, mini diary, daily briefing, memo, video player, FM radio, media browser, voice recorder, e-mail and pre-installed Asphalt 5. MP3, AAC, AAC+, e-AAC+, WMA, AMR, WAV, MP4, MPEG4, H.263, H.264, WMV, FLV, DivX, XviD, MKV, (FLAC Bada 1.2) Also supports subtitles. On the end of December 2011 the OS was updated to Bada 2.0 in many countries gradually. The first official Bada 2.0 was the LA1. With Bada 2.0 the Touch-wiz reach the version 4.0, the GUI was totally revisited and are included many features as full multitasking, WAC, vocal commands, text-to-speech, speech-to-text, ChatON, Caster, new version of DLNA and social apps and the new browser Dolphin 3.0 with download manager. Due to many owners of the phone disliking the Bada software many people have worked on porting the popular Android O.S to the Wave, The ported versions known are Froyo, Gingerbread, Ice Cream Sandwich, Jelly Bean and Kitkat. However they are still being developed and some features, such GPS, may be limited or not function as intended. Last updated on 18 January 2014 at 00:35.